Electoral and political arena is only one of the grounds through which political agenda of vested interests is achieved. Capturing of people’s mind, the ideological propagation, is the foundation on which political agenda stands and perpetuates itself. That’s how the change in History text books or teaching a communal version of History is a necessary part of sectarian nationalism in many South Asian countries. In Pakistan the communal elements teach that foundation of Pakistan begins with the victory of Mohammad bin Kasim in Sind in eight century! One knows that the basic difference in the kingdoms and nation states is too gross to be glossed over like this but any way if communalists have the levers of power, like education, in their hands anything can be manipulated and presented in a form which indoctrinates the large section of population. That’s how when the NDA Government came to power last time around (1999), one of its action was changing the history books to bring in the communal version of the past. This time around with BJP led NDA coming to power with bigger majority, matters are going to be worse off if one looks at what is being planned in the arena of education in particular. Had Prof Rao done some rational study in to untouchability, caste system and other practices, which were criticized by many during rising Indian national movement, he would have known that caste system’s adverse effects were not due to the rule of Muslim kings, but were inherent in scriptures, which reflected social system of that time. As such the social arrangement of that time gradually got transformed into hereditary system. With this purity-pollution came in; an accompaniment much before the advent of rule of Muslim kings. Muslim kings as such did not change the social system of caste in any way. That was not their goal anyway. On the contrary the Muslim community itself came to adopt caste system at social level. While in Pakistan the communal Historiography refuses to recognize the existence of Hinduism, Hindus, in India the communal thinking puts all the blame of abominable social customs to ‘outside’ influence. 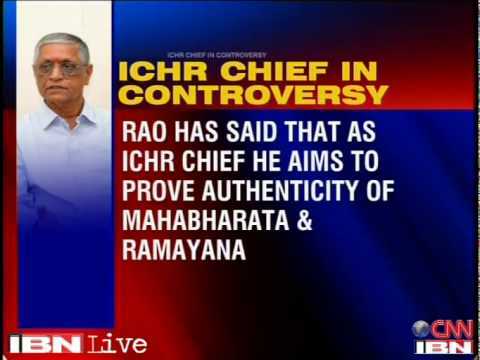 In tune with that the attempt of the new Chief of ICHR is to put the blame of the adverse practices of caste system to external factors, the Muslim rule. In Prof. Rao’s fictional history, the inconvenient portions are omitted and the picture is created ‘where’ all the evils are due to external factor of Muslim kings. At basic level he forgets that Muslim kings retained the social system prevalent here and their administration was a mixed one, Hindu-Muslim one, e.g. 34% of Court officials of Aurangzeb were Hindus. This ideologically indoctrinated Professor wants to erase from his and our memory the fact that caste system and oppressive gender hierarchy do get well articulated in Manu smriti, which reflects the social norms which came to be rooted by first and second Century AD. There are quotes in the Rig Veda and Manusmriti to show that low castes were prohibited from coming close to the high castes and they were to live outside the village. While this does not imply that a full-fledged caste system had come into being in Rig Vedic times, the four-fold division of society into varnas did exist, which became a fairly rigid caste system by the time of the Manusmriti. The first major incursions of Muslim invaders into India began around the eleventh century ad, and the European conquests of India began in the seventeenth–eighteenth centuries. The shudras began to be excluded from caste society, and ‘upper’ castes were barred from inter-dining or inter-marrying with them. Notions of ‘purity’ and ‘pollution’ were enforced strictly to maintain caste boundaries much before that. Shudras became ‘untouchables’ and this rigid social division that Manu’s Manav Dharmashastra (Human Law Code) codified. The best contrast in the approach to abolition of the caste system and untouchability can be seen in the approaches of Ambedkar and Golwalkar. The former, holding Manusmriti as the upholder of caste system initiated a social movement which led to burning of this holy tome, while the latter wrote eulogies of Manu and the system of law provided by him. As far as the argument that ‘the system served well and there no complaints’, is half true and half false. Yes it worked well for the upper castes who were the beneficiaries. It was oppressive and inhuman to the lower castes. Yes, there are no complaints recorded, very true. The low castes were excluded from the arena of learning, so there is no question of dissatisfaction being recorded. While as a matter of fact right from the time of Lord Buddha, the protests against the caste system came up, Buddhism itself was a movement against the system of caste hierarchy. The medieval saints like Kabir and his likes powerfully expressed the sigh of oppression of the lower castes, their suffering at the hands of the beneficiaries of the caste system, whose cause Prof Rao is espousing and upholding. What direction our scholarship of the past, caste-gender hierarchy will take is becoming clear with the changes which have been brought in ICHR. Sign of times to come!